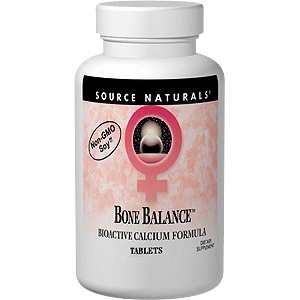 Bone Balance is a scientifically advanced calcium formula designed for women in their menopausal years. Bone Balance contains a 1-1 ratio of calcium and magnesium, along with other bone minerals and soy isoflavones, to provide support to bones. Contains no egg, gluten, or wheat. Contains no salt, or artificial color, flavor or fragrance. To maximize calcium utilization, take 1 tablet at breakfast and dinner and 2 tablets at bedtime. Warning: If you are pregnant or breastfeeding, consult your health care professional before using this product. Vitamin C (as magnesium & calcium ascorbates, ascorbic acid & manganese ascorbate) 72 mg, Vitamin D-3 (as cholecalciferol) 50 IU, Vitamin K 250 mcg, Vitamin B-6 (as pyridoxine HCl) 5 mg, Folate (as folic acid) 150 mg, Calcium (as calcium citrate, carbonate, malate, fumarate, ethanolamine phosphate & ascorbate) 150 mg, Magnesium (as magnesium oxide, citrate, fumarate, malate & ascorbate) 150 mg, Zinc (as zinc chelate) 2 mg, Copper (as copper sebacate) 250 mcg, Manganese (as manganese ascorbate) 2 mg, Genistein-Rich Soy Concentrate (SoyLife) Yielding 6.4 mg total Isoflavones 208 mg, Silica (from horsetail silica extract) 3 mgm L-Lysine (HCl) 15 mg, Boron (as amino acid chelate) 750 mcg. Other Ingredients: Stearic acid, modified cellulose gum, acacia (vegetable gum), sorbitol, magnesium stearate and colloidal silicon dioxide. 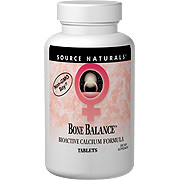 Bone Balance Eternal Woman is shipped in a discrete, unmarked package. Orders are processed immediately and usually take about 3 to 5 working days to be received. We do ask that you try it for 2 to 3 weeks to feel the full effects. Any information received is used only for order processing and shipping purposes. Your information, such as e-mail address, will never be disclosed to a third party.